A year ago today I wrote about financial regulation . As the G20 meeting on April 2 approaches, the topic is more relevant than ever. I argued last year that when the Glass-Steagall wall between banking and non-bank financial institutions was torn down in 1999, the law should have extended U.S. regulatory authority beyond banking to all the other institutions. My views were shaped by research I did at the FDIC. I developed a state credit-quality indicator, based on bank examiners' classification of loan quality at insured banks. The indicator deducted 20 percent of the loan value classified as substandard, 50 percent of loans classified as doubtful, and 100 percent of loans classified as loss. The results were included in an article I wrote with Professor George Benston published in the Journal of Money, Credit and Banking, "Bank Examiners' Evaluation of Credit". Whatever use a state credit-quality indicator might have had as an early warning system (e.g., of mortgage-quality problems in Arizona, California, Florida and Nevada) disappeared when mortgage loans were wrapped up into securitized packages that were beyond easy classification by bank examiners and were camouflaged by AAA ratings by rating agencies and insurance companies. The Chairman of the UK Financial Service Authority (FSA), Lord Turner, on March 18 has highlighted for the G20 socially undesirable financial innovation as a key source of the global crisis. He recommends regulation of near-bank activities such as hedge funds and credit-rating agencies, with a Europe-wide financial body to set standards and supervise. The UK seems to have joined the hawkish German and French authorities. regulate the shadow banking system, with heightened standards put in place after the economy began to rebound. A broad consensus has emerged that hedge funds must be registered and more closely monitored, probably by the Securities and Exchange Commission. The U.S. plan will probably give the government greater authority over large troubled companies not now regulated by Washington. The Treasury secretary would have authority to seize a struggling institution after consulting with the president and upon the recommendation of two-thirds of the Federal Reserve board. The government now can seize only the banking unit that controls federally insured deposits of large troubled institutions. 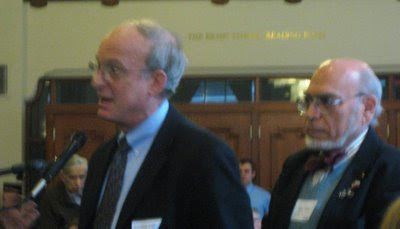 Ross Sandler (L) and Mark Page. All photos by JT Marlin. NY State's Gov. David Paterson has agreed with legislative leaders to close a NY State budget gap for FY 2009 of $1.6 billion. But now a monster gap of $13 billion is awaiting the Governor in ten days. In some ways, NY City is better off than NY State, because the biggest part of NYC's tax base is the property tax. NYC's annual property assessments are averaged over five years, creating a surge of revenue as the averages keep rising for two or three years after the beginning of a decline in property values. When recovery starts, of course, NYC doesn't get as much revenue as it would if assessments were recognized more rapidly, but then the income-and-sales taxes are bouncing up and the City doesn't need the money as much. However, when NY State catches a cold, NYC gets pneumonia because NYC depends on the State for aid. Half the State’s revenues come from NYC, but something less than half comes back to NYC in aid. So a gap of $13 billion at the State level without raising taxes might mean $6 billion less aid for NY City. That's another thorn in the side of Mark Page, the man who has been a steady hand on NYC's fiscal wheel as director of NYC’s Office of Management and Budget since Mayor Bloomberg took office in 2002. He was introduced not long ago by Mr. Ross Sandler of the New York Law School. developing and implementing the city’s budget, monitoring and forecasting the revenues and expenses of the city, analyzing the economy, evaluating agency management improvement initiatives, and issuing bonds in the public capital markets in conjunction with the New York City comptroller. Mr. Page joined OMB in 1978 as deputy counsel, was named general counsel in 1980 and had the title of deputy director added in 1982. He is reputed to hate giving speeches and is hard to locate at a podium other than responding to questions from members of the NY City Council. He's actually a pleasure to listen to as he speaks in perfectly formed sentences without any apparent reference to notes. I had a chance to listen to him at New York Law School and took some photos and notes. I started reporting below what Mr. Page said, but midway I received word that a videotape of his comments had been posted online, at which point I decided I would stop typing up my notes. I have posted the link to the NYLS videotape at the end. NYC OMB Director Mark Page. The banking industry has been engaged in in an extended use of vapors. Washington is engaged in a dramatic wielding of stimulus dollars. Here in New York City, we are engaged in questions about the frequency of garbage collection, the number of workers in the parks during the summer, and high school class size, the daily oatmeal of government. Government budgeting is not that complicated. It has to do with handling the fact that we want to get more services, like more frequent garbage collection, and pay less taxes... and preferably eliminate taxes. It’s easy to do more and tax less when you’re getting more money out of existing tax rates. Economic expansion gives us more. But then when you get in the inevitable reciprocal cycle, a given tax structure gives you less money to spend on services. As I have heard it said very loudly at MTA meetings, in a downturn you are likely to have to tax more for less services. This is not a very seductive premise, particularly as government is political. To make this point, we have divided our spending into controllable and uncontrollable costs. In government there are some things that are very difficult to avoid paying for. For an individual, the analogy might be with mortgage payments. Jonathan Gelber (L) and Roger Herz. For New York City government, the stuff you are really stuck with paying starts with debt service and pension benefits. We’ve done a lot over the last seven years with bringing the East River and Harlem River bridges up to standard. We’ve spent a lot on building and maintaining schools and roads. And we have the debt to show for it. To hear how Mr. 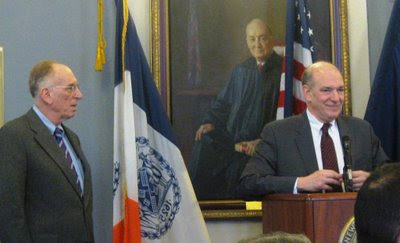 Page's speech proceeded, with questions from audience members like Jonathan Gelber, Roger Herz and Henry Stern (all shown in photos) go to the videotape here. PEACE | What Happened to Our Dividend? When the Berlin Wall came down in 1989 and the Soviet Union disintegrated, many of us looked forward to a Peace Dividend, a reduction in military spending that would allow more U.S. Government spending on public needs like health care or education, or tax cuts, or a combination. We got the tax cuts but the Peace Dividend has melted away. Spending on the ongoing wars in Iraq and Afghanistan have replaced spending on the Cold War, and U.S. military spending is still at the level it was in 1990. In FY 2008, the federal budget shows $751.6 billion for defense. This is made up of four elements: (1) DoD spending (line 051) of $583.1 billion, (2) Nuclear weapons in the Department of Energy budget, $24.2 billion, (3) Veterans Administration, $86.6 billion and (4) borrowing cost of unfunded military expenditure, $57.7 billion. However, the Bureau of Economic Analysis (BEA), in the Department of Commerce, shows a higher number for national defense consumption and gross investment expenditure, $734.8 billion. If we again add in Veterans Affairs ($86.6 billion) and interest on military-related borrowing (which BEA figures is $163.0 billion), the total is $984.4 billion, nearly $1 trillion. So how does this compare with 1990? MilEx as Share of GDP. One measure of the change between 1990 and 2008 is military spending as a share of GDP. The media tend to report the 2008 figure as 4.1 percent. This is the lower line in the first chart below, which I reproduce by permission from Professor Jurgen Brauer of the James M. Hull College of Business at Augusta State University in Augusta, Ga. But that uses the DoD budget number without the DOE’s nuclear weapons complex, without the VA, and without the interest cost for military-related debt. If the BEA’s numbers for defense spending are used, as in the top line in the chart, the ratio is 6.9 percent of GDP. By the U.S. government’s own accounts, military expenditure is two-thirds higher than the usual media report. MilEx as Share of Federal Spending. 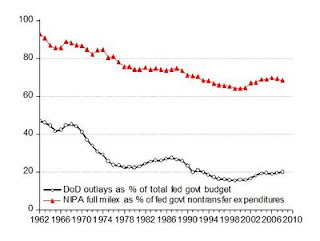 The second chart shows military expenditure as a percentage of the overall federal budget. is loaded down with transfer payments, that is, monies that come in and go out simply because federal law mandates that they be handled through the feds. Examples are social security contributions that pay for grandpa’s monthly check or money that residents of Oklahoma pay in federal taxes that then go back to Oklahoma to fund schools or build highways there. When transfer payments are removed, the budget for federal functions is only $1,440.6 billion, of which BEA's $984.4 billion in military expenditure is 68.3 percent, as shown on the top line on the chart. That’s not 20 cents on the federal dollar but 70 cents. 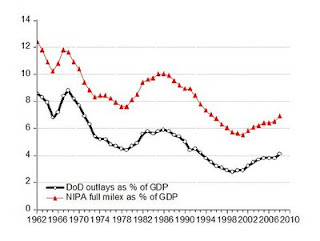 Spending on defense has come down since the 1960s. But compared with 1990 the Peace Dividend has disappeared. As the Democratic Administration wrestles with huge U.S. economic problems, elected officials can take comfort in the fact that they have an easy act to follow. 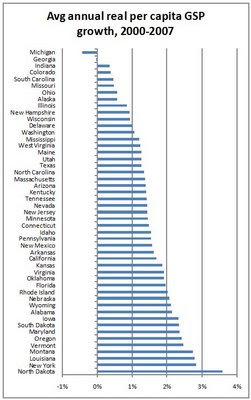 The numbers are in, and under Bush 43 only four U.S. states beat the average long-term growth rate. The four "winner" states that did better than the long-term U.S. per-capita average annual growth rate of 2.5 percent were North Dakota, New York, Louisiana and Montana. (Louisiana wins on a technicality as is explained below.) 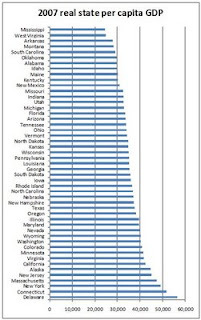 The other 46 states grew at less than the long-term average growth rate. The numbers are through 2007, but we know that 2008 was a recession year, so the final numbers by state will be worse. The state records are on two charts prepared by my friend Professor Jurgen Brauer of the James M. Hull College of Business at Augusta State University in Augusta, Ga. His numbers are from the St. Louis Fed's FRED database, which vacuums population data from the U.S. Census and Gross State Product (GSP) data from the Bureau of Economic Analysis. With Prof. Brauer's permission I am using his chart showing average annual real growth in per-capita GSP during the first seven Bush 43 years. Two of the bottom five states in real per-capita GSP average annual growth rates switched from “red” to “blue” in the November 2008 presidential elections. Only four states in the nation beat the long-term per-capita average annual growth rate for the United States of 2.5 percent since the late 1920s. Louisiana is an anomaly for its growth is at least partially explained by the exodus of poor residents following Hurricane Katrina so that the improvement in its average growth rate for the remaining residents is a statistical fiction. Prof. Brauer's second chart shows the state-by-state per-capita value of economic production in 2007. The top ten states by per-capita GSP in 2007 are Delaware ($56,500 GSP per capita), Connecticut, New York, Massachusetts, New Jersey, Alaska, California, Virginia, Minnesota and Colorado (the District of Columbia is not included). The bottom ten states are Mississippi (less than $25,000 GSP per capita), West Virginia, Arkansas, Montana, South Carolina, Oklahoma, Alabama, Idaho, Maine and Kentucky. Should the weak economic performance of the states during the 2001-2007 years be a surprise? Michael Kinsley, writing in the Washington Post in 2005, concluded that the Democrats did better since 1960 on the Republican ("Daddy"-party) criterion of economic prosperity. From 1960 to 2005 the GDP in year-2000 dollars rose an average of $165 billion a year under Republican presidents and $212 billon a year under Democrats. Measured from 1989, or measured with a one-year delay, or both, the results are similar. [On the] average annual rise in real per-capita income, Democrats score about 30 percent higher. Bush 43 did not reverse this weak economic record. In his NY Times column today, "Bad News, and More Bad News," Clark Hoyt responds to mail that complains of the NY Times writing too much about bad news. He says: "A newspaper's responsibility is not to be an economic cheerleader, but to maintain a level head and help put the world in perspective for readers. "[A]s bad as things are, they are still not as bad as the recession of 1982, let alone the Great Depression." Does Mr. Leonhardt still say that? If so, I would respond that his comparison between today and 1982, which he based on job-market data, is a case of apples and oranges. The reason for the recession that produced high unemployment in 1982 was Fed Chairman Paul Volcker's brave determination to break the back of inflation. In the process he allowed interest rates to soar. The 1980-82 recession was painful, but recovery was entirely within the control of the Fed, which simply had to ease credit. Continuing credit problems today are not the deliberate creation of the Fed, which has--on the contrary--eased the target fed funds interest rate down to the "zero bound". To say that 1982 was worse is like someone suffering an angina attack saying that his heart was worse off right after his triple-bypass operation. Not so, because the surgeons then had the situation under control. A consensus is growing that this recession is the worst downturn since the Great Depression. It's global. it looks only at U.S. data and misses the full extent of the devastation from the credit freeze. The IMF’s Dominique Strauss-Kahn, said on March 10: "I think that we can now say that we've entered a Great Recession." Prior uses of the term "Great Recession" (which was applied to earlier recessions) have been collected by Catherine Rampell of the NY Times using Nexis and were quoted by World Wide Words. WWW does not mention the prominent March 1 NY Times Op-Ed by economic historian Niall Ferguson. On December 5, 2008 the U.S. Federal News Service reported: "Some economists are already calling this 'the Great Recession' because they fear it may be longer and deeper than any recession in recent history." As early as April 2008, Former Wall Street Journal writer Jesse Eisinger predicted in Portfolio that: "The next president will take office during what may well come to be known as the Great Recession." One year ago, in March 2008, I contributed three posts for HuffPost about the Bankers' Panic of 2008. I was focused on regulatory shortcomings and what could be done about them, rather than the likely economic consequences. A March 10, 2009 poll reports that 53 percent of respondents say the United States is at least somewhat likely to enter a 1930’s-like Depression within the next few years. The Rasmussen Reports national telephone survey found that 39 percent think this outcome is unlikely. The latest results are more pessimistic than those found in early January, when 44 percent said a 1930’s-like Depression was likely. It will be a big challenge to restore positive “animal spirits”. But the poll may be a sign of “blood is in the streets” –- Main Street as well as Wall Street. At dinner yesterday I spoke with Georg Kell about business support of the UN. Georg is Executive Director of the UN Global Compact and is thinking ahead about the world's needs and how business and the UN can help meet them. My interest in this is lifelong. My father was a member of the U.S. Budget Bureau team at the founding of the UN in San Francisco in 1945 and he worked for two UN agencies during the next two decades. Business in 1945 was a huge supporter of the UN–think of the gift of six Manhattan blocks to the UN from John D. Rockefeller, Jr. Business looked forward to the UN's role not just in promoting peace but in supporting through its specialized agencies a global infrastructure, such as safe airports and air traffic controls. Georg is focused on resurrecting this business support, which waned during the years when news about the UN seemed to revolve around ideology. Georg is a native of Munich and started his career as a venture capital analyst. He became a UN civil servant 18 years ago. The first ten years of his career he worked with UNCTAD. On the 50th Anniversary of the UN he wrote a paper giving five reasons why the UN is good for business and deserved more support. This paper attracted the attention of UN Secretary-General Kofi Annan... and Georg was soon given his present mandate. Georg views 1945 as one of the great moments of history when support for the UN came from a broad swath of the world. The UN was seen as an agency for development to ensure peace. Development requires private investment, so business was a natural ally. Georg sees his job with the Global Compact as rebuilding the sense of partnership between business and the UN in advancing the goals of peace and development. - Challenges to the Global Business Model. What happens to world trade if businesses shorten their supply chains or, worse, if countries look inward to their domestic industries and move to defend them with protectionist tariffs or quotas or other barriers? - Best Practice for Business in Conflict-Prone Areas. The idea of divestment of subsidiaries from countries that are prone to conflict is being critiqued as making the situation worse. What are best business practices in such areas? - Response to Climate-Change Worries. Scientific certainty about the threats from climate change is growing and is contributing to a new sense of urgency among businesses about the need for action. The UN will convene a conference in Copenhagen on May 24-25 that will bring together 500 CEOs or senior corporate staff along with other stakeholders. Georg sees the solution as a carbon tax or perhaps some form of carbon cap. The global financial meltdown has made executives more humble about their ability to withstand financial and non-financial (environmental, human) risks. Georg believes that a major shift has occurred, back toward thinking with a longer-term time horizon. Sustainability is not being taken for granted as much as it was a few years ago. Business is more somber, more about functionality, about quality, about durability. My Dad's labors show how useful the UN can be. In 17 years as Director of Technical Assistance at the International Civil Aviation Organization, he built up a crew of 1,500 ICAO technical experts working with airports all over the world to ensure safe air travel. Pilots of a German airline flying into Tokyo or Moscow learned to communicate smoothly in a common language with airport controllers to anticipate weather conditions, take off and land safely. Georg Kell and the Global Compact are embarked on a new round of missions for the UN in partnership with world business. Their work offers hope for economic recovery, conflict reduction and a sustainable environment. March 10, 2009–French Finance Minister Jean-Baptiste Colbert, the second after Fouquet to serve under Louis XIV, said that the art of taxation consists in so plucking the goose as to obtain the largest possible amount of feathers with the smallest possible amount of hissing. The golden geese in New York City are the top 1 percent of NYC taxpayers, the 41,282 filers earning $500,000 or more. They pay 47.8 percent of the $7.3 billion collected by the city in income taxes. The concentration of golden feathers is much greater now than in 1993, when approximately the same share of taxes, 47.6 percent, was paid by more than five times as large a share of taxpayers, the 5.5 percent earning $100,000 or more. Why has the concentration of taxpayers become so much more intense? Three explanations come to mind: (1) Inflation ($100,000 ain’t worth what it was in 1993). (2) The financial bubble, which in recent years was good to top-earning New Yorkers. (3) The number of NYC personal income-tax filers, which has increased to 4.1 million from 2.7 million in 1990. One thing hasn’t changed much–average personal income tax rates in Manhattan are higher than in the other boroughs. Back in 1993, the average effective tax rate was 3.05 percent–3.58 percent in Manhattan and less than 3 percent in all of the other four boroughs. NY City and NY State officials are seeking to raise tax rates further on the highest categories of personal incomes. Council Speaker Christine Quinn has proposed boosting the city's income tax from 3.65 to 4.25 percent for those earning $297,000 or more; to 4.45 percent for those making $532,000 and to 4.65 percent (a percentage-point increase) for the $1.2 million league and above. Comptroller Bill Thompson is supporting higher taxes for the top category. Albany legislators are also seeking to raise the state income tax -- from 6.85 percent to 8.25 percent for people making a minimum of $250,000; 8.97 percent for those making $500,000 and above in taxable income and 10.3 percent for those at the $1-million-and-up level. The basic concern is how do you collect revenue from New York City's tax base if you have a relatively small group of individuals paying a very large proportion of your income-tax revenue. A consoling fact for New Yorkers is that state and local taxes have been deductible against income on which federal taxes are imposed. But there is a question about what new tax rules will emerge from the budget debate that is taking place in Washington. Concerns are properly growing about the 8.1 percent unemployment rate reported for February and the higher rates that are on their way. But the true pain of unemployment is close to twice this rate. The Bureau of Labor Statistics routinely provides the data to report the higher rate. The standard unemployment rate averaged 5.8 percent in 2008. A higher number of 10.5 percent takes account of three additional categories, including (1) workers who are too discouraged to look for work, (2) others "marginally attached" to the labor force, and (3) workers who have settled for part-time jobs. Reporting the higher rate along with the standard one would help make clear why unemployment rates have been higher in much of Europe (France, Germany, Italy, for example) than in the United States. The reason, in part, is that European unemployment benefits extend longer, so workers are recorded as officially unemployed for longer. In the United States, workers settle for part-time work rather than have no job at all. The red and the light blue lines both go back to 1960; the others back to 1994. The red line is called U3 unemployment and depicts the United States’ “official” unemployment rate, averaged over the months for the respective year. In 2008, the monthly unemployment rate ranged from 4.8 percent of the civilian labor force in April to 7.1 percent in December, with an average for the year [shown in the chart] of 5.8 percent. The light blue line at the bottom of the chart is called U1. This measures long-term unemployment, namely the proportion of those who are willing and able to work (i.e., people who are actively looking for work) yet nonetheless are unemployed for 16 weeks or more, that is, about 4 months or longer. U1 shows the same up and down pattern as U3, and the reason government officials track it is because it indicates long-term hardship. 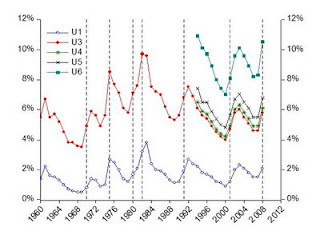 The other three lines are called U4, U5, and U6 unemployment, respectively, and have been tracked only since 1994. U4 adds in so-called discouraged workers, a subset of those “marginally attached” to the workforce, that is, folks who are willing and able to work but have become so discouraged about their labor market prospects that they have stopped looking for employment. U5 adds all other marginally attached workers (those who want to work and have looked for work but whose primary reason why they are not in the workforce right now is non-job market related). U6 rounds this out by including those who are employed part time for economic reasons, that is, they want to work full time but cannot get anything other than part time. The U4 and U5 numbers only add about one percentage point. But U6, which includes those who say they want and are looking for full-time work but can get only part-time work, adds 3-5 percentage points. In 2008, U3 was 5.8 percent but U6 was 10.5 percent, a difference of 4.7 percentage points, nearly double. 1. Repeal of Glass-Steagall: The 1999 repeal of the Glass-Steagall Act helped create the conditions in which banks invested monies from checking and savings accounts into creative financial instruments such as mortgage-backed securities and credit default swaps, investment gambles that led many of the banks to ruin and rocked the financial markets in 2008. Comment: The 1999 law tore down the wall between banks and investment banks. Senator Carter Glass was a leader in Congress both of the effort to create the Federal Reserve System and the 1933 Glass-Steagall law that forbids banks from engaging in investment banking, merchant banking or insurance activities. Paul Volcker has said he thinks one of the first things that needs to be done to fix the system is to restore the wall between investment banking and commercial banking. 2. Off-the-Books Bank Accounting: Holding assets off the balance sheet generally allows companies to avoid disclosing “toxic” or money-losing assets to investors in order to make the company appear more valuable than it is. Comment: In his memoir of his years as Chairman of the SEC, Arthur Levitt, Jr. complains about the huge lobbying effort by accounting firms. 3-4. CFTC Blocked from Regulating Derivatives: Financial derivatives are unregulated. By all accounts this has been a disaster. Warren Buffett warned they represent "weapons of mass financial destruction". They have amplified the financial crisis. The Commodity Futures Trading Commission (CFTC) sought to exert regulatory control over financial derivatives during the Clinton era, but failed to get the authority. The non-regulation of financial derivatives was again assured in 2000, with the Commodities Futures Modernization Act. Comment: These two steps were crucial. They were victories for “financial innovation” – i.e., non-regulation. Passage of the Commodities Futures Modernization Act under the leadership of Senator Phil Gramm prohibited any incursion by the CFTC into regulating financial derivatives. 5-6. Excessive Capital Leveraging Was Encouraged. In 1975, the Securities and Exchange Commission (SEC) promulgated a rule requiring investment banks to maintain a debt-to-net-capital ratio of less than 15 to 1. In simpler terms, this limited the amount of borrowed money the investment banks could use. In 2004, however, the SEC succumbed to a push from the big investment banks, led by Goldman Sachs, and authorized investment banks to develop net capital requirements based on their own risk assessment models. With this new freedom, investment banks pushed ratios to as high as 40 to 1. Meanwhile global bank regulators, in a program known as Basel II, should have been tightening up capital requirements but, influenced by the banks themselves, have been moving in the opposite direction, toward letting commercial banks rely on their own internal risk-assessment models. Comment: It’s as simple as ABC. Bank examiners look at the loan portfolios of banks to ensure Adequacy of Bank Capital. The potential for systemic meltdown is huge when investment banks have debt-to-net-capital ratios as high as 40 to 1. 7-9. No Predatory Lending Enforcement: Banking regulators retained authority to crack down on predatory lending abuses, but they sat on their hands. The Federal Reserve took three formal actions against such abuses in 2002-2007, while the Office of Comptroller of the Currency took three in 2004-2006. When the states sought to fill the vacuum created by federal non-enforcement of consumer protection laws against predatory lenders, the Feds stepped in and prohibited states from enforcing consumer-protection rules against nationally chartered banks. Under the doctrine of “assignee liability,” anyone profiting from predatory lending practices should be held financially accountable. With some limited exceptions, however, assignee liability does not apply to mortgage loans. Rep. Bob Ney worked hard to keep this effective immunity. Comment: Bank supervision was lax. It happens when everyone seems to be making money. 10. Fannie and Freddie Enter Subprime. Fannie Mae and Freddie Mac were dominant purchasers in the subprime secondary market. The Government-Sponsored Enterprises were followers, not leaders, but they did end up taking on substantial subprime assets -- at least $57 billion. The purchase of subprime assets was a break from prior practice, justified by theories of expanded access to homeownership for low-income families and rationalized by mathematical models allegedly able to identify and assess risk. Fannie and Freddie are responsible for their own demise. 11. Merger Mania: Megabanks achieved too-big-to-fail status. While this should have meant they be treated as public utilities requiring heightened regulation and risk control, other deregulatory maneuvers enabled them to combine size, explicit and implicit federal guarantees, and reckless high-risk investments. 12. Credit Rating Agency Failure: Wall Street packaged mortgage loans into pools of securitized assets and then sliced them into tranches. The resultant financial instruments were attractive to many buyers because they promised high returns. But pension funds and other investors could only enter the game if the securities were highly rated. The credit rating agencies enabled these investors to enter the game, by attaching high ratings to securities that actually were high risk. The Credit Rating Agencies Reform Act of 2006 gave the SEC insufficient oversight authority. The SEC must give an approval rating to credit ratings agencies if they are adhering to their own standards -- even if the SEC knows those standards to be flawed. Enough "Blood on the Streets"? How low can the market go? In 1815, Nathan Rothschild said that the time to buy stocks was "when there is blood on the streets". Are we there yet? The Great Depression lasted a decade but the Dow industrial index fell 89 percent from its high of 381 on September 3, 1929 to its low of 41 on July 8, 1932. The economy remained sour for the rest of the decade but the stock market picked up. For the enthralling story of what happened during those years, I recommend chapters 17-20 of Liaquat Ahamed’s timely Lords of Finance: The Bankers Who Broke the World. I had the pleasure of listening to Liaquat talk at a recent evening event in New York City. 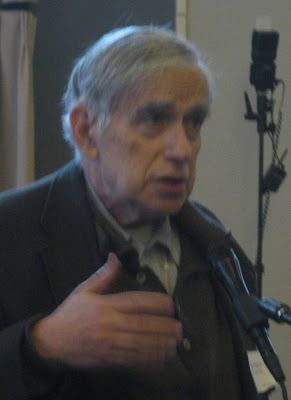 He modestly disclaimed knowledge of the financial disasters that were going to happen and simply said that the Time magazine cover showing Robert Rubin, Larry Summers and Alan Greenspan with the caption “Committee to Save the World” suggested to him the idea for his book. The title reminded him of the name given to the top bankers working on global financial problems after World War I, “The Most Exclusive Club in the World.” The book studies the origins of the Great Depression that is clearly told by taking the different perspectives of the four leading actors of the period, the Lords of Finance -- Montagu Norman in the UK, Benjamin Strong at the New York Fed, Hjalmar Schacht in Germany and Emile Moreau in France. Yesterday’s stock-market drop brings us to a cumulative decline that can only be compared with the 1930s. Fearful of today’s jobs report, investors drove the major U.S. stock averages down 4-7 percent. Jack McHugh has tallied from StockCharts.com how far down this took the markets from their peaks. I think we can all agree that what ails our economy and markets is worse than anything since that awful time [the Great Depression], and the worst punishment Mr. Market has meted out since the 1930’s was a drop in the S&P 500 of just less than 50% (1974 & 2002). Dow Jones Industrial Average — All Time High: 14,198. March 5 - Down 53.6% to 6594. Standard & Poor’s 500 — All Time High: 1576. March 5 - Down 56.7% to 683. Russell 2000 — All Time High: 856.50. March 5 - Down 59.2% to 349.45. KBW Bank Index (BKX) — All Time High: 121.16. March 5 - Down 84.3% to 18.97. AIG (39 cents – less than it costs to mail a letter). Citigroup (98 cents). E*Trade (66 cents). Fannie Mae (39 cents). Freddie Mac (39 cents). Unisys (37 cents). Ford ($1.83). GM ($1.83). Las Vegas Sands ($1.97). MGM ($1.99). CIT ($2). Kodak ($2.50). Bank of America ($3.15). New York Times ($4.00). News Corp ($6.15). Xerox ($4.36). International Paper ($4.22). Alcoa ($5.55). GE ($6.75). Dow Chemical ($6.56). Wells Fargo ($7.95). Dell ($8.50). In terms of timing, the Dow peaked before FDR came to office – before he was even elected. So the fears are lingering longer than they did then. In what ways are markets and economies possibly worse off than in 1932? - Expectations are higher because billions of people in the developing countries who were anticipating joining the global economy are seeing their hopes dashed. The 1930s effects were severe but were concentrated on the industrialized countries. The potential for instability in some countries is great and the proliferation of weapons makes this scarier than it would have been in the 1930s. - The size of the credit overhang is much larger. The gold standard, for all of its faults in extending the distress in the 1929-33 period, kept a lid on the growth of credit. Today’s system has no natural limit to credit growth. Credit-market exposures today exceed GDP – in the United States by 50 percent, estimates Liaquat, in the UK by four times, and in Iceland by eight times GDP. - In the world’s second-largest economy, Japan, the stock market has fallen 81 percent from its peak at the end of 1989. This 20-year decline raises questions about how quickly the world's current mess can be cleaned up. March 5, 2009–Here, and I thought the inflation dragon was reliably on vacation as the Great Recession reduces demand for goods and services, but unit-cost (cost-push) inflation seems to have returned in the fourth quarter of 2008. The BLS announced today revised figures for the fourth quarter of 2008 that show labor productivity declined 0.4 percent from the previous quarter in the overall nonfarm business sector, as output fell faster than hours. Unit labor costs increased 5.7 percent over the prior quarter at a seasonally adjusted annual rate. The decline in productivity was greatest in the manufacturing sector, where productivity (output per hour) fell 4.0 percent, a downward revision (from -3.0 percent) of one percentage point from numbers previously announced on February 5. Output dropped 17.7 percent, and hours fell 14.2 percent. The declines were all the largest since the series began in second-quarter 1987. Unit labor costs increased 14.7 percent. Within manufacturing, reduction in hours exceeded reduction in output in nondurable manufacturing. But reduction in hours was less than reduction in output in the case of durables. In the durable goods manufacturing sector, productivity dropped 14.8 percent, as output per hour fell 26.9 percent and hours declined 14.2 percent. (See Table B.) The decreases in output and output per hour were the biggest since the series began in second-quarter of 1987. The loss of productivity would not surprise Harold Cole, Lee Ohanian and Ron Leung, who concluded (2005) that monetary shocks only account for one-third of the wouldwide loss of output in the Great Depression and that lowered productivity shocks accounted for two-thirds of the loss. It’s not surprising that durable manufacturing would be showing a decline in productivity at a time when the future of the U.S. auto industry and other industries is in doubt. Imagine being an auto worker in this environment. Prescriptions for antidepressants have increased 15 percent during the last year even though marketing for them has fallen. There isn't much argument against the idea that personal depression reduces productivity. But higher unit labor costs won't help U.S. manufactures compete at home or overseas.